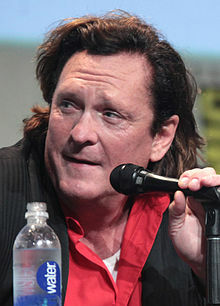 For other uses, see Michael Madsen (disambiguation). Not to be confused with the Danish actor Mads Mikkelsen. Michael Søren Madsen (born September 25, 1957) is an American actor, producer, director, writer, poet and photographer. He has starred in many feature films and television series. Madsen was born in Chicago, Illinois. His mother, Elaine, was a filmmaker and author. His father, Calvin, was a firefighter. His parents divorced in the 1960s, and his mother left a career in finance to pursue a career in the arts, encouraged by film critic Roger Ebert. His siblings are Cheryl Madsen, an entrepreneur, and Academy Award nominee Virginia Madsen. Madsen's paternal grandparents were Danish, while his mother is of English, German, Irish, Native American and Scottish ancestry. Madsen began working at the Steppenwolf Theatre Company in Chicago, where he served as an apprentice under John Malkovich and appeared in a production of Of Mice and Men. In Quentin Tarantino's directorial debut film Reservoir Dogs, Madsen played Mr. Blonde, a villainous mobster. He did not get the role of Mr. Pink (which went to Steve Buscemi), which he wanted because it had more scenes with Harvey Keitel. For Pulp Fiction, Madsen declined the role of Vincent Vega, which went to John Travolta. Madsen starred in Mike Newell's gangster film Donnie Brasco (1997). He once said of these films: "Some of them I'm only in for 10 minutes, but they bought my name, and they bought my face to put on the DVD box with a gun. What people don't always understand is that I established a certain lifestyle for my family back in the days of Species and Mulholland Falls and The Getaway. I wasn't about to move my six kids into a trailer park. So when people offered me work, it wasn't always the best, but I had to buy groceries and I had to put gas in the car." In Kill Bill, Madsen played assassin Budd, the brother of Bill (David Carradine) The film was released in two parts, Vol. 1 and Vol. 2. In 2004, Tarantino discussed an idea for the film to unite Madsen and Travolta, as The Vega Brothers. In 2007, Tarantino said the film (which he intended to call Double V Vega) was "kind of unlikely now", because of the age of the actors and the onscreen deaths of both characters. Madsen appeared in Uwe Boll's BloodRayne, a film he described as "an abomination... It's a horrifying and preposterous movie". He won Best Actor awards at the Boston Film Festival and New York International Independent Film and Video Festival for his performance in Strength and Honour. He played himself in the mockumentary Being Michael Madsen. Madsen co-starred in Coma, a Web series on Crackle. Madsen played Jim Ricker, the old friend of Jack Bauer (Kiefer Sutherland), in the final season of 24. Madsen starred in the comedy film Let the Game Begin. On January 5, 2012, he entered the Celebrity Big Brother house, where he finished in 4th place in the final. In February 2014, he played Las Vegas casino mogul Ted Binion in Josh Evans' film Death in the Desert. The screenplay was written by John Steppling, based on the book Death in the Desert by crime writer Cathy Scott. In August 2014, he starred in the Kill Bill-themed music video for the song "Black Widow" by Iggy Azalea featuring Rita Ora. Madsen starred in the ensemble western film The Hateful Eight (2015). He was among a number of people rumored to have leaked the film's script, before it was released causing Tarantino to almost not make the film and eventually rewrite it. In 2016, he played a dramatized role of former Texas Ranger Phil Ryan in Real Detective on the Investigation Discovery network. In 2017, Madsen signed on as executive producer of the crime-thriller The Dirty Kind, written and directed by Vilan Trub. After being screened some footage and the trailer for the film by producer Derek Zuzunaga, Madsen agreed to sign on as EP and make the film citing a need for more quality independent films in the genre. Madsen has been writing since the early 1990s. He began writing on match books, napkins and hotel stationery in between his time working on film sets and traveling around the world. In 2005, 13 Hands Publications compiled all of his poetry and released The Complete Poetic Works of Michael Madsen, Vol I: 1995–2005. The original books released were Beer, Blood and Ashes (1995), Eat the Worm (1995), Burning in Paradise (1998), and the now out-of-print A Blessing of the Hounds (2002), 46 Down; A Book of Dreams and Other Ramblings (2004) and When Pets Kill (2005). His friend, Dennis Hopper, described his poetry as a throwback to the Beat Generation: "I like him better than Kerouac: raunchier, more poignant, he's got street language, images I can relate to, blows my mind with his drifts of gut-wrenching riffs; this actor is a poet and he is cool, of course, he is Michael Madsen." Madsen has noted influences for his style of poetry, as being Jack Kerouac and Charles Bukowski. In 2008, Madsen was invited and appeared in Norway for the Norwegian translation and release of Burning In Paradise. In November 2010, he was the guest of honor for his poetry at the Crossing Border Festival at The Hague. Another book of poetry, American Badass, was released on September 25, 2009. Madsen dedicated the book to the memory of his friend and Kill Bill co-star David Carradine. His latest book, Expecting Rain, was released in October 2013 with an introduction by Jerry Hopkins. Madsen is also an accomplished photographer. In 2006, he released his first book of photography entitled Signs of Life, which contained new selections of his poetry and was published by 13 Hands Publications. It was also dedicated to the memory of his friend Chris Penn. Madsen's first wife was Georganne LaPiere. He married Jeannine Bisignano from 1991 to 1995. They have two children, including their son Christian. In 1996, he married DeAnna Madsen. They have three children. He also has one daughter named Jessica. In 2002, Madsen was presented an award for his work with the Shriners Hospital for Children, and gave a Porsche 928 to his casting director friend Bruno Rosato. In September 2009, Madsen announced his participation in the Love Ride 26 to help raise money for local charities and those less fortunate. The charity included the celebrities, including Malcolm Forbes, Peter Fonda, Larry Hagman, Billy Idol and Bruce Springsteen among others. The event took place on October 25, 2009, but was canceled in two weeks due to poor ticket sales and a decline in sponsorship and vendor support. Madsen also has a line of hot sauces called American Badass. In 2016, Madsen hosted the event An Intimate Evening with Michael Madsen to benefit Children's Pediatric Cancer. Madsen won the Lifetime Achievement Award at Red Hen Press in 2006. 2008 Best Actor New York International Independent Film & Video Festival for Strength and Honour. Madsen won the 9th Annual Malibu International Film Festival award on April 6, 2008. Independent Firecracker Award for his book of poetry "Burning In Paradise". Madsen won Best Supporting Actor IFS Film Festival for Along the Roadside in March 2013. Madsen won Ensemble of the Year for The Hateful Eight at the Hollywood Film Awards. ^ "Michael Madsen on beating up Justin Bieber, the 'Reservoir Dog' ear and why he regrets his tattoos". ^ Bhattacharya, Sanjiv (17 April 2004). "Michael Madsen: Mr Blonde's ambition". the Guardian. ^ Kennedy, Lisa (2007-02-21). "A strong role, an equal partner". The Denver Post. Archived from the original on 2007-04-03. Retrieved 2007-05-31. ^ Bray, Tony (April 2004). "Virginia Madsen". TV Now. Retrieved 2007-05-31. ^ a b c "Michael Madsen interview: How The Hateful Eight star ducked and dived his way through Hollywood". The Independent. ^ "Michael Madsen: Mr. Blonde's ambition". The Guardian. ^ Haddon, Cole (2008-08-07). "Michael Madsen Talks Hell Ride, Inglorious Bastards, and Sin City 2". Film.com. Archived from the original on 2008-10-23. Retrieved 2008-11-18. ^ Sciretta, Peter (April 7, 2007). "Quentin Tarantino talks Vega Brothers, the Pulp Fiction & Reservoir Dogs sequel/prequel". Slashfilm. ^ "Madsen still scarred by BloodRayne movie". contactmusic.com. ^ "Michael Madsen, George Hamilton and Paul Ben-Victor Star in Coma, an Original Web Series Premiering On Crackle.com". 2008-08-22. Retrieved 2009-03-05. ^ "24 Season 8 Episode 19 Press Release (10:00AM – 11:00AM)". 24 Spoilers. Retrieved 14 December 2014. ^ "Death in the Desert (2015)". IMDb. 9 October 2015. ^ Jessica Harmon (11 October 2015). "Death in the Desert rolls up new trailer". moviepilot.com. ^ "Iggy Azalea - Black Widow ft. Rita Ora". YouTube. Retrieved 14 December 2014. ^ "Quentin Tarantino Shelves 'The Hateful Eight' After Betrayal Results In Script Leak". Deadline. ^ "Michael Madsen-Real Detective". Starburst Magazine. ^ Frauenfelder, Mark (April 12, 2013). "Michael Madsen talks to Boing Boing about his hot sauce". Boing Boing. ^ "Fundraising Gala! An Intimate Evening with Michael Madsen". www.facebook.com. Retrieved 2017-11-12. Wikimedia Commons has media related to Michael Madsen.